These three items should come with your car, and can usually be found in your boot. If you don’t have these three items you should replace them straight away. Do You Love Extra Peace of Mind? It’s important to find a place to pull over that is safe, and even better if that place is flat. Cheap AZ Towing suggests somewhere like a quiet side street, a car park, or a safety zone along a highway. Make sure you put your hand break on, and turn your hazard lights on before you get out of the car. If you have wheel wedges, place them in front of your front tyres. This will further prevent your car from moving. If your front tyre is flat, place them at the back. If you have a hubcap remove it so you can access the lug nuts. Once you have access to your lug nuts loosen them with a quarter or half turn. It might take quite a bit of force, don’t be afraid to put your weight behind. Place the jack under the vehicle frame next to the tyre you are changing. If you’re not sure where exactly to place, Cheap AZ Towing suggests you it check your Vehicle Owner’s Manual. Once the jack is in the right position, raise the vehicle until the flat tyre is about 15cm from the ground. Do not put any part of your body under the car whilst the vehicle is raised. Unscrew the lug nuts the rest of the way, and pull the tyre towards you until it’s off the wheel hub. Place the spare tyre on the hub, and gently manoeuvre the tyre into place so the lug bolts show through the rim. 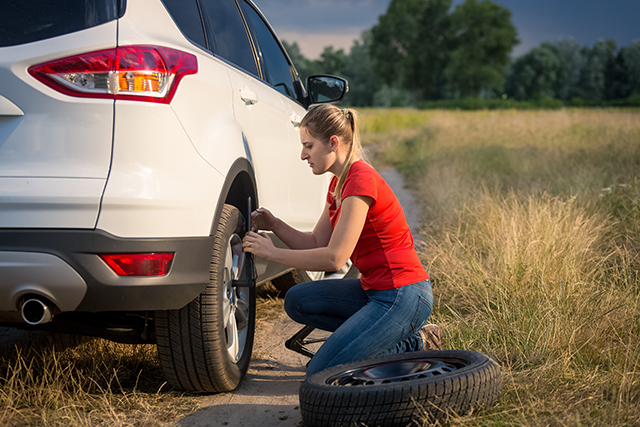 Tighten the lug nuts as much as you can by hand, lower your vehicle back to the ground but not so the full weight of the car is on the ground. Tighten the lug nuts again with your lug wrench. Again, Cheap AZ Towing recommended to put all your weight behind it. Once you lower your vehicle completely, do your best to tighten the lug bolts again, as much as possible. If possible drive carefully to the nearest service station to check your tyre pressure. Otherwise head to the nearest tyre repair store to get your tyre repaired. If you’re spare fails you, or you don’t have the proper equipment to change your tyre, Cheap AZ Towing can help! Call us on 0488 166 449.